NEW ORLEANS — Tennessee senior quarterback Joshua Dobbs has been selected as the Manning Award Quarterback of the Week after earning more votes than the seven other Manning Award Stars of the Week in the Allstate Sugar Bowl’s Facebook fan vote. 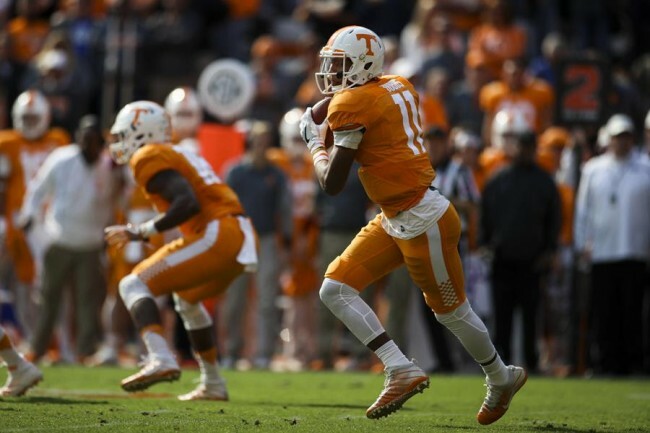 Dobbs accounted for five touchdowns for the Vols in their 49-36 victory over Kentucky on Saturday. Dobbs completed 11 of 17 passes for 223 yards, throwing three touchdowns and one interception. He also rushed for 147 yards and two touchdowns on 14 carries. Dobbs gave the Vols a 14-10 lead with 1:30 left in the first quarter when he punched in a one-yard touchdown. The score marked the 26th rushing touchdown of his career, making him Tennessee’s all-time leader in rushing touchdowns by a quarterback. With a 45-yard touchdown run in the fourth quarter, Dobbs now has 27 career rushing touchdowns, including seven in 2016. With 370 total yards (223 passing, 147 rushing) against Kentucky, Dobbs now has 8,145 yards of total offense (passing, rushing, receiving) in his career. He joins Peyton Manning (11,020), Casey Clausen (9,577) and Erik Ainge (8,473) as the only Vols with 8,000 yards or more of total offense. Dobbs’ 147 rushing yards marked the second-highest total of his career and the fifth time in his career he had rushed for 100 or more yards. The Tennessee offense averaged 10.2 yards per play against the Wildcats, which was the Vols’ best mark since averaging a school-record 10.9 yards per play against Kentucky in 2000. The Vols also averaged 9.2 yards per rush, marking their best rushing average since 9.5 yards per carry against Auburn on Dec. 4, 2004. Tennessee will celebrate Senior Day on Nov. 19 when the Vols take on Missouri at 3:30 p.m. ET. The game will be televised on CBS.